Dog Policy in Brower Park–Does it provide a safe environment for people and dogs? How do we prevent another loved pet, a child, or a random park visitor, from being hurt? How do we make visiting Brower Park a pleasurable experience for everyone in the community? Share your experiences and ideas concerning the off-leash dog policy in Brower Park. 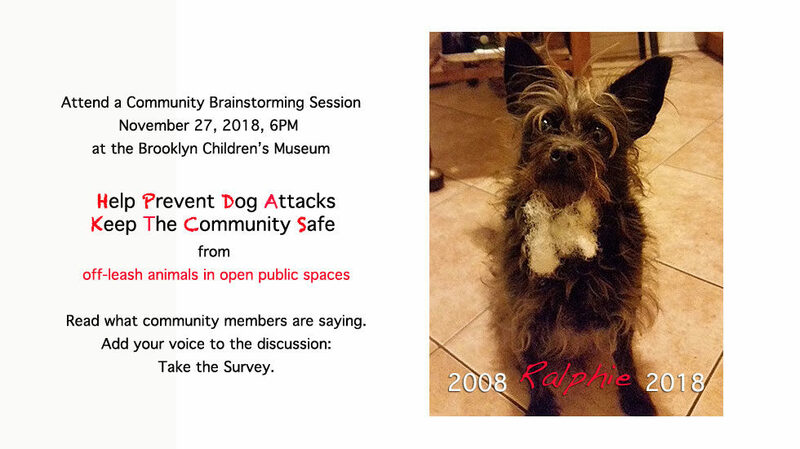 We will share your ideas, not your identity or contact information, with the Community including the NYC Parks Management, NYC Elected Officials, the Brooklyn Borough Presidents Office, and Brooklyn Community Board 8. Friends of Brower Park with Borough President Eric Adam’s Office will be holding a Community Brainstorming Session on November 27, 2018 at 6PM. It is being generously hosted by the Brooklyn Children’s Museum. Please leave your contact information so we may communicate with you before the Brainstorming Session. More importantly, take the time to fill out the survey, share your ideas and experiences. Survey information is now available following the Survey form on this page. The data will be updated as it is received. If you have not filled out the survey please do so now. I’m sharing my experiences by telling Ralphie’s story along with ideas that may help prevent the next tragedy. Please share your ideas and experiences and by doing so help determine the right Dog Policy for Brower Park and the Brower Park Community. My beloved dog Ralphie was killed by a large, off-leash dog emerging from Brower Park. The trauma of this attack has left me with nightmares and images I can’t stop from replaying. I no longer feel safe walking my dog Beau in or near Brower Park nor do I cross the street when a large dog appears.On Wednesday evening, August 29, 2018, at approximately 10:30 PM, I took my two small dogs, Beau and Ralphie out for a walk from my apartment on Park Place opposite Brower Park. As the park is often inundated with off-leash dogs in the evening I purposely walk my dogs on the sidewalks outside the park to avoid any altercations with roaming dogs. As we walked past the park entrance, located along Park Place near Kingston Avenue, I was alerted to a fast movement and running sound coming from my left, from the direction of Brower Park’s main lawn. I quickly picked up Ralphie to protect him. A large off-leash dark brindle dog leapt up and clamped his jaws on Ralphie’s body and my arm. As I screamed, NO NO NO, and attempted to get the dog to release us the owner finally caught up with her dog. The dog ignored her attempts to control him. I directed her to lift the dog’s hind legs; the dog unclenched at some point; the owner leashed the dog, and proceeded to walk simply away. She walked away irrespective of the fact that my dress and undergarments were saturated with blood and that my beloved dog was virtually lifeless. As a stranger offered to drive us to a local emergency veterinarian, I asked neighbors, who appeared on the scene, to stop the woman. They pursued her but she would not stop. A helpful bystander caught up with the woman and insisted she contact me. Ralphie was pronounced dead on arrival. My dress and undergarments were saturated with his blood. As I removed my bloody garments in the shower the outline of my dress, drawn in Ralphie’s blood covered my body. The following day, I went to the emergency room, to have my wounds treated. I then went to the 77th Precinct to make a report. I was subsequently informed by a neighbor that as he saw the attack, he approached police officers in a patrol car parked by the Basketball Court and alerted them to the ongoing attack they refused to intervene. The officers did absolutely nothing, and simply sat in their car both during, and after the attack. This was the second attack since January by an off-leash dog in Brower Park. Ralphie, had been hospitalized four years ago by an off-leash dog that grabbed him around the neck. In January 2018, at approximately 11a.m. in the morning I was walking both my dogs when, out of the blue, an unleashed dog attacked my dog Ralphie from behind. Then too, the owner retrieved her dog and left the scene without any acknowledgement of Ralphie’s extensive injuries. Ralphie required six months of rehabilitation including three operations at a cost of approximately $16,000. Subsequently, to the attack, I attempted to file a report with the 77th precinct, which refused to take a report because it was a dog-on-dog event. I ultimately made a report to the Parks Committee of Brooklyn Community Board 8. I paid this bill from my retirement fund. This is a painful story to tell. It represents a mix of profound personal loss and civic outrage. I am a dog owner, and nature lover, a long-term community member and a volunteer to the NYC Parks Department in my volunteer capacity as the Chairperson of the Friends of Brower Park. Ralphie died brutally because of what I consider inappropriate dog policy for Brower Park. We need an immediate alternative to the current off-leash dog policy that endangers humans and their pets. I hope our Brower Park Community by coming together will find a reasonable alternative that allows all of the community to enjoy Brower Park. The status quo creates too high a risk to Public and Dog Safety and limits park enjoyment. Adults who would enjoy walking through the park on warm summer evenings but are simply scared of dogs. Listed are change ideas for Dog Policy. Please take this opportunity to add your own to the survey. All attacks by dogs whether against humans or other dogs must be recorded to provide an accurate accounting of dog and dog owner behavior. There need to be consistent consequences for dog owners disobeying rules. Public safety is paramount. There needs to be a victims fund set up to cover the financial and emotional cost of these attacks. Possibly as part the dog licensing process. Animal Adoption facilities must provide training & management before an adoption can be finalized including full disclosure of the dog’s history with a clear acknowledgement of the responsibility the potential owner is taking on and the consequences of not adhering to recommendations. To learn about general Dog policy in NYC Parks read the Dogs in NYC Parks then read how the NYC Parks Department has applied these rules to Brower Park. Policy Statements: Needed Changes to Ensure Public Safety. Check the box if you agree. Dogs should not be allowed off-leash in Brower Park until an enclosed space is created. Prohibit off-leash hours in the Brower Park Oval immediatly until an enclosed dog run is sited and built. What is going on with the soccer players with cleates ripping up our new lawn so my daughter and I cannot play catch with out worrying about getting hit by a goal miss? Dogs with known aggression issues toward other dogs or strangers should be kept on a leash at all times regardless of the time of day and amount of people presently in the park I would prefer no off-leash dogs in the park. No dogs should be allowed in the park, especially after the recent event. The park cod probably benefit from better lighting. Animal Care and Control should provide ongoing support and training assistance for the guardians of every adopted animal. Immediately have the city parks repair and return the enclosed fenced offleash dog run of Lincoln Park (near handball courts). Recently, several large segments of the fence were removed by the city. This allowed pedestrian pass through, but destroyed its modest role as a dog run. Until then, it had been a useful part of Lincoln Park for dog owners that bothered nobody else in the large fields. Its demise may be adding to pressure if people are going to Brower instead. Midsummer, City took away 2 large sections of the fence enclosure, leaving openings so large in the fencing that it’s unusuable as an offleash place. I stopped going there, instead went to Bushwick’s Maria Hernandez Park, which is excellent and serves ALL types of park users. More NYPD Officers walking through & enforcing laws in the park. Dog breeds with known dangerous propensities must be muzzled with out amongst the public. Put in a fence around the field with some openings for easy access. Every since the old one was taken down there have been numerous more incidents of dogs running off into the street. The fence created a boundary the dogs understood and often respected. Make separate dog runs for big and small dogs; use double-gates so no escapes. Visit Maria Hernandez Park (on Irving Place, Bushwick) around 5 p.m. to see how dog parks can work within a multi-use city park. I want to keep the hours as is. The people who disobey off-leash hours will certainly not use a dog-run, therefore, incurring such an expense to address a small population of violators will not improve the situation. Violators need to be held responsible for their actions and those who follow the rules (vast majority) should not be punished. I don’t think there should be a dog run in Brower Park. It has always been for use by the children the the playground, from the school and the museum. Dogs should not be allowed off-leash in Brower Park until an enclosed space is created., Off leash rules should be reviewed, possibly rescinded. Immediate temporary enclosure for a dog run.